Over time I did some smaller and bigger modifications to it, both hardware and software wise, which I present in this blog, to give something back. 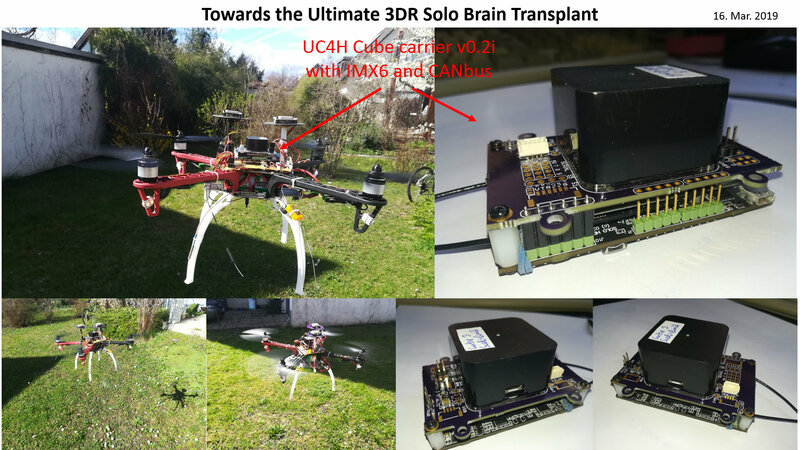 As part of my UAVCAN for Hobbyists (UC4H) project, which brings CANbus devices to ArduPilot drones at a small cost and with unprecedented completness, I’ve designed a UC4H Cube carrier board which snugly fits onto the IMX6 of the Sololink. I call this the Ultimate 3DR Solo Brain Transplant, since it’s so much cleaner and more compact than re-purposing the Solo motherboard or using one of the available Cube carriers with the IMX6 somehow connected to it. It also brings all the benefits of UC4H to the copter, such as UAVCAN ESCs, dual GPS, and many more too numerous to be listed. So, this had to be tested. And indeed, I just could complete a first test flight, which – not unexpectedly – was perfectly successful. Best 3rd Party Gimbal for 3DR Solo? The gimbal cable in the Solo uses a really unusual connector, and connecting a third-party gimbal, such as a STorM32, can be a real pain because of that. I initially cut through some wires and extended them, which of course worked, but was ugly. 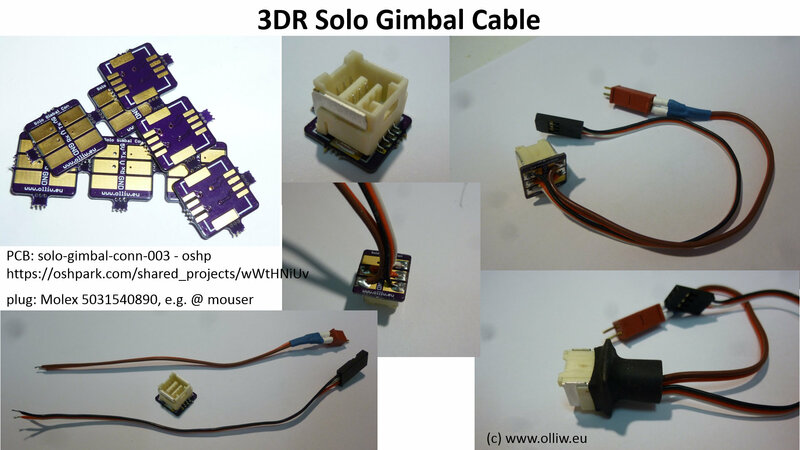 So, I designed a small PCB, which yielded a nice adapter cable, which directly fits to my STorM32 gimbals. I like having access to the USB port of the Cube, since it’s really the simplest and quickest approach to adjust parameters and upload firmware. There is however not much space to install a regular USB extension cable, and my tweaks, while perfectly working, didn’t had been great. So I designed a little PCB, which I find highly useful also in a number of other projects. One issue present with essentially all third-party gimbals is the infamous „horizon drift“, i.e., a tilting of the horizon in fast flight maneuvers. I now, finally, completed a project I had in mind for long, the STorM32-Link, and got it fully working, and in particular also working for the Solo. The performance is – IMHO – just impressive. Well, you all know about this: Solo’s Smart Shots are its best part, but getting them to work with a third-party gimbal is an issue. So, I decided to work out the ultimate solution and made all required changes to BetaCopter. And it works. Flawlessly :). 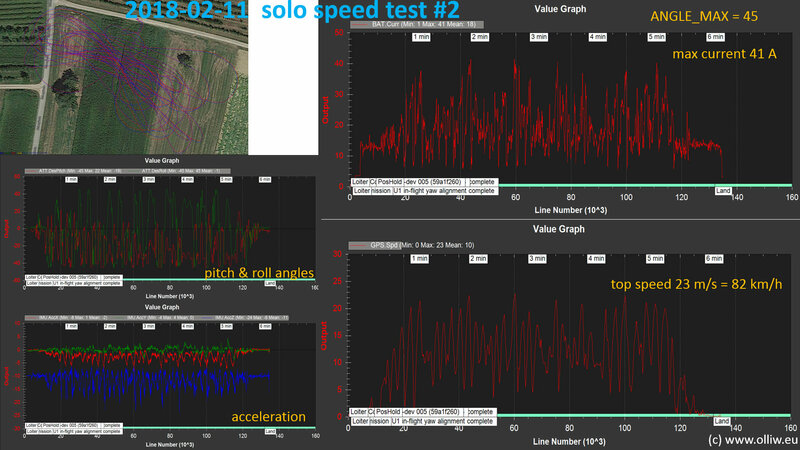 Since I wanted to flash ArduCopter, or BetaCopter in fact, on my Solo, but didn’t wanted to do a pricy upgrade to e.g. a green Cube, I decided to install UC4H ESC mini modules in the Solo in order to overcome the stock Solo’s „motorpod issue“. The goal obviously was to get, thanks to BetaCopter, perfectly working smart shots with a STorM32 gimbal. 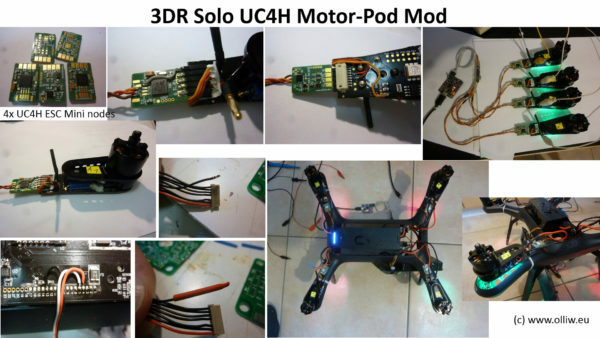 The Solo’s infamous „motorpod issue“ prevents us from flashing the stock Solo with the ArduCopter code, since a code piece introduced by 3DR in their firmware version to account for the „motor pod“ issue has not been taken over. Various „mods“ such as installing the green Cube or the infamous level-shifter mod are known. 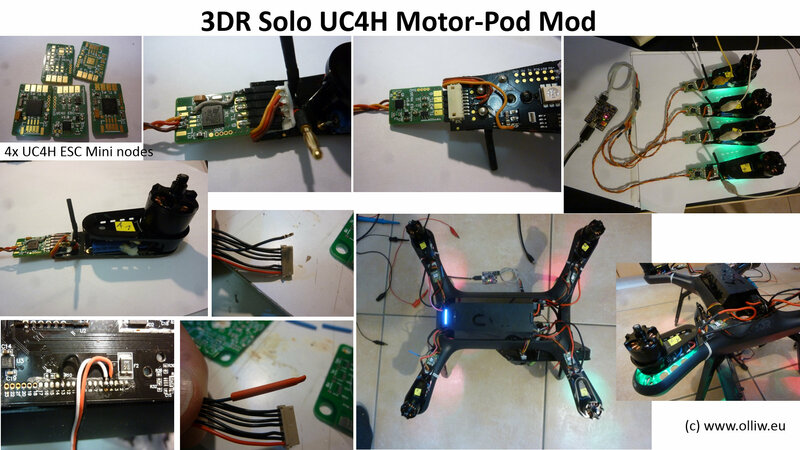 I use the UC4H ESC mini modules as converters from UAVCAN to PWM, which when installed close to the motor pods and connected properly, feed them with nice and clean 3.3 V PWM signals, overcoming the issue. As regards of the origin of the „motor pod“ issue many myths are around – the Chinese wispers effect, too many people distribute to many could be’s, without actually knowing anything. So I analyzed carefully (reverse engineered) the motor pods, with the conclusion that the concept will work, also from an engineering perspective. 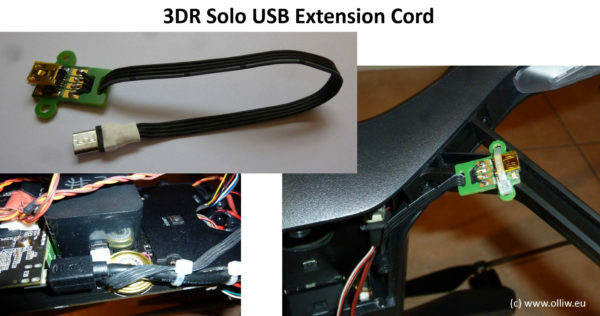 The conversion of the Solo unfortunately wasn’t as simple as it could be, since the mini ESC PCBs were just not designed for that purpose. This is kind of sad, since with properly designed PCBs the conversion would be nearly plug&play (just one wire would have to be soldered). Anyways, I had these PCBs, so I went with them. The conversion is shown in the pics below. Most importantly, the converted Solo indeed FLIES! And perfectly so. I didn’t had yet ANY issue because of this modification.